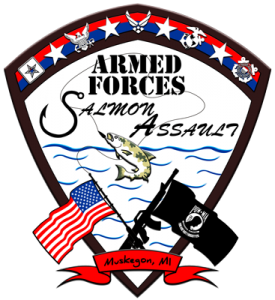 Just got done with a cool Logo design and ground up static build for The Armed Forces Salmon Assault fishing tournament put on by the Muskegon Charter Boat Association. The 2nd annual event will take place on May 19, 2012, on Lake Michigan. 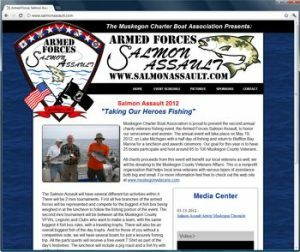 The MCBA and the Salmon Assault board recently allowed me the honor of being a part of something special for our city. The board came to me with a rough sketch of a logo that to put it frankly, was very complex. A bordered off badge utilizing a Red, White and Blue flag inspired palette, with all 5 branches of the armed forces logos, as well as a camouflage fish, and both the P.O.W. flag and the American flag. It took a while but I pieced it all out in vector shapes and came out with a pretty great looking final product. We ended up with approximately 7 colors which is a little more than I like to go with usually, but for this product a less is more philosophy just wouldn’t be sufficient. When I unveiled it to the board, they where very happy about it. 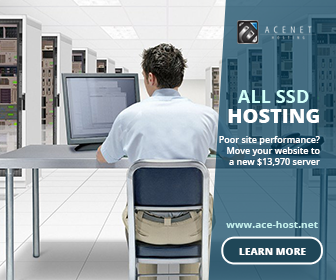 As we had spoken about the web design and what they wanted, we decided on a somewhat traditional wire frame, similar to the 231 Graphics site, which is utilization of simple main navigation, with a nice big visual header. We needed to show off the water and the fishing, at the same time as keeping the focus on our cause which is “Taking Our Heroes Fishing”. I really feel like we pulled it off and that it is a site worthy of pride. It will be interesting to see what this site looks like down the road, as we are far from done, and will be adding content up to and shortly after the event is all done. 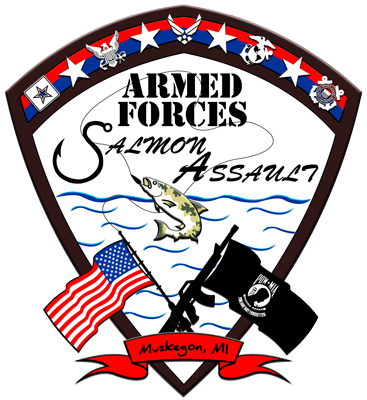 Visit the Armed Forces Salmon Assault website today!